Today is National Fragrance Day, which may mean diddly squat to you. Except if you're at work, and someone has decided to microwave last night's leftover shrimp scampi. Or, loaded on the Paco Rabanne cologne. Someone else decides to burn a wintergreen candle on their desk. It's not that there is anything wrong with any of these scents, but they can become a problem in the workplace where not everyone shares your love of Dragon Noir perfume or the smell of popcorn at 8 a.m. As a result, more employers are paying attention: An OfficeTeam survey finds that 19% of workers say their companies have scent-free policies. One of the biggest issues is that if someone has a problem with a certain smell, they're likely to suffer in silence. The OfficeTeam research shows that 46% of workers say they keep mum on a smell they don't appreciate, while 17% confronted the person and 15% asked human resources to do something about it. As most of us know, anytime someone is "suffering in silence," it can find an outlet in other ways. Your heavy use of cologne may be enough for other teammates to avoid including you in a meeting on a key project. Your smelly lunches may so secretly annoy a cubicle mate that she doesn't warn you that you've got a mistake in a report. Also, keep in mind that sometimes heavy scents can trigger migraines or allergies from co-workers, and do you really want to take on their work when they're forced to go home because they're ill from your perfume or aftershave? I'm not saying your desk candle is going to sabotage your career, but why risk it? You want to ensure that people enjoy working with you -- not secretly complain you're stinkin' up the place. In the past 10 years or so I have lost my sense of smell. I actually have no idea if I am offending my neighbor so I make sure to shower every day, wash my clothes regularly (whether they need it, but just to be on the safe side), I brush my teeth regularly and use mouthwash, and I only use unscented products, including dryer sheets, laundry soap, hair products, deodorant etc. A few months ago a friend retired and gave me some hand lotion that she had never used. One day I decided to try it and people were coming to me saying how awful it smelt. It was even making some people feel sick because of the thick perfume smell. Because they know I can't smell, they felt comfortable coming to me. Otherwise, it can be a hard thing to do because you never know how people are going to react. I used to work in an office where one of my co-workers who was from another culture had no problem burping in the office. And they weren't silent burps either, but were loud and deliberate. I never knew where to look or what to do. I had just moved to this new area in the office so I mentioned it to my friend, who had previously sat at that desk, whether she had heard this guy burping and she said he's doing a hell of a lot more than burping. I had thought I had heard other sounds coming from his office, but wanted to give him the benefit of the doubt. The unusual part was his office was right next door to the Director of HR, who must have heard the noise, but never a word was said. I think we all just tried to ignore it or hoped someone else would say something. A friend nicknamed him 'Gassy Gus'. I also worked with a male boss who had a very strong sweat odour. He was a senior manager and I often wondered why the other executives didn't say anything because it must have been hard to take when behind closed doors in a meeting. All that to say, I hope I have never offended anyone at work with unwanted smells, but if I have I would like to know, but it would be hard to hear and whoever told me would need to do it very gently. Thanks, Patricia. 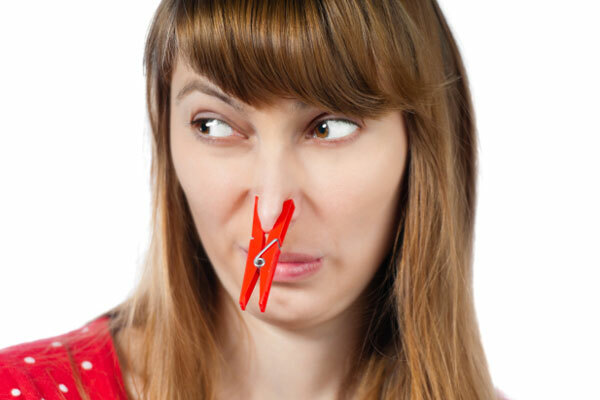 Most HR departments are used to dealing with issues of smell or poor hygiene and are much better equipped to handle the problem than an employee trying to find a way to say something. With more diverse teams working together, I think this isn't a problem that is going to go away -- HR will need to do more to educate workers about how their "fragrance" or personal habits affect others (aka Gassy Gus). It seems to me if more people took your attitude and were proactive and open to making any changes necessary, this is an issue that could be resolved quickly. Thanks for your comments.